Experience the enveloping sound of DTS:X™ and Dolby Atmos® featuring the Reflex Optimizer for Dolby Atmos-enabled speakers, accompanied by the spectacular view of Ultra HD video, HDR10, HLG (Hybrid Log-Gamma), and Dolby Vision. 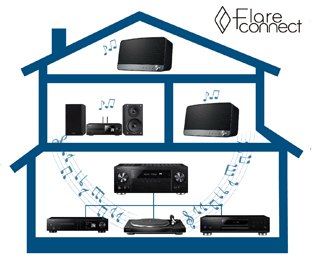 FlareConnect™, Chromecast built-in, and DTS Play-Fi® let you stream music anywhere across the house. Listen to a multitude of songs via internet radio and network streaming services, controlled by the Pioneer Remote App. With Powered Zone 2, and a phono and 7 HDMI inputs, a wide range of options are offered on the Elite® SC-LX502. The Class D3 Amplifier based on Pioneer’s Multichannel Stereophonic Philosophy is capable of simultaneous high-power. With the Direct Power FET directly connected to the print circuit board without any wiring, you can enjoy quality sound, quick response, and high efficiency, as well as save energy. The custom bypass capacitors further enhance the advantages of the Direct Energy HD amplifier, producing powerful bass while also featuring gentle expressiveness. The Class D3 amplifier is ideal for reproducing the latest HD content encoded by Dolby Atmos or DTS:X and high resolution audio. High directivity sound reflects off the ceiling, while low directivity sound directly reaches the ears. This difference causes a phase shift, making the sound feel uncomfortable. To solve this, the new technology optimizes the performance of your up-firing elevation speakers for your listening environment, by aligning the phase of direct and indirect sound, matching the basic tone, and optimizing the upward-oriented frequencies. The result is overall seamless sound with Dolby Atmos enabled speakers, allowing the ideal reproduction of three-dimensional surround sound. The SC-LX502 supports pass-through for Dolby Vision, HLG (Hybrid Log-Gamma), and HDR10 signals. By connecting a compatible source device, you can enjoy these latest video standards on a compatible display. What’s more, all HDMI terminals support 4K (60p/4:4:4/24-bit*), Wide Color Gamut (BT.2020), and HDCP 2.2, so you will have no problem when upgrading to new devices, and can also enjoy premium content such as 4K videos with digital copy protection. * 4:4:4/24-bit signal is not supported via front terminal. The SC-LX502 comes with Chromecast built-in, so you can use your mobile device to stream your favorite music, radio, or podcasts to your speaker. You can control the audio from anywhere in the house using Chromecast-enabled apps running on your personal device—iPhone, iPad, Android phone and tablet, Mac and Windows laptop, and Chromebook™. Discover Chromecast-enabled apps at google.com/cast/apps. DTS Play-Fi* wirelessly streams any audio content from any compatible mobile device to the SC-LX502 and DTS Play-Fi compatible audio systems, creating a multi-room system in your home. You can stream different sources to different speakers at the same time from the DTS Play-Fi app.